I recently read a recipe for Vietnamese stew in Food and Wine that intrigued me, so I began comparing it to other Vietnam stews on Google. I was surprised to find that it was almost identical to every other Vietnamese stew on line. My recipe is similar, too, but I have increased or decreased spices to end up with a sauce that has layers of flavors—-salty, spicy, pungent, sweet and loaded with umami. I have also thickened the sauce. A traditional Vietnam stew has sauce that is more like soup and I prefer my sauce to coat the beef. I have lots of tricks up my whisk for making stew, which I have included in my recipe. 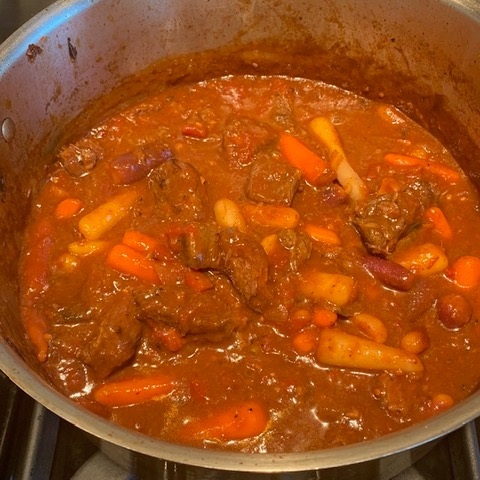 That makes the directions look a little long; it also involves 2 extra steps, like refrigerating the stew at least 24 hours before serving and then removing the meat from the sauce in order to thicken it. I accomplish this by stirring in a little cornstarch dissolved in water. This is called a slurry. You should make the stew ahead of time and refrigerate it overnight or for up to 2 days. Why? The flavor improves when made ahead, but more importantly, this gives the fat a chance to rise to the surface. Cook in the oven instead of on the stove. Why: The heat is more even and it frees you up to do other things. Press a sheet of parchment paper directly on the meat and sauce when finished cooking. Why? The parchment keeps the meat that is above the sauce from drying out; but more importantly, when you remove it, all the congealed fat comes up with it. After refrigerating, remove the meat to a separate bowl. Why? It will enable you to easily thicken the sauce without having to stir the thickening around all the meat. Now it’s time to invite friends over for a comforting, zippy and soul warming dinner. It’s so good you might want to double the recipe so you’ll have leftovers. Or you might want do as they do in Da Nang. Bake an egg on each serving and enjoy it for breakfast. Divine. If you put the star anise in a tea strainer or wrap them in cheesecloth they will be easy to remove. Marinate the meat for 30 to 45 minutes at room temperature. Sear the meat on high, but if the drippings on the bottom begin to burn, immediately reduce heat to medium. Press parchment directly on the meat and sauce to keep the meat from drying out. Remove meat from sauce with a skimmer. Discard lemongrass. bowl, toss beef with marinade ingredients until well mixed. Marinate at room temperature for 30 to 45 minutes. To cook: Preheat oven to 325°F. Heat 1 tablespoon oil in Dutch oven on high until hot. Swirl to coat bottom of pan. Remove half of the beef from the marinade and carefully arrange in one layer in pan. Cook for 2 minutes without stirring, then stir often until browned on 2 to 3 sides, about 4 minutes. If drippings in pan begin to burn, reduce the heat to medium. Remove beef to a bowl. Repeat with 1 tablespoon oil and remaining beef. Pour reserved marinade in bottom of bowl over meat. Reduce heat to medium. Add 1 tablespoon oil, onion, garlic and ginger to pan. Cook, stirring often and scraping bottom, until onions begin to soften, about 5 minutes. Stir in tomatoes, broth, coconut or plain water and star anise. Bring to a boil over high heat. Cover and move pot to oven. To bake: Bake for 20 minutes, then check to make sure the sauce is simmering (small bubbles breaking above the surface). Adjust oven temperature if needed. Stir, cover, and continue baking for 1 hour and 15 minutes total. Remove from oven and immediately press a sheet of parchment paper directly on the meat and sauce, pressing on it so it completely covers the stew. To make ahead: Cool to room temperature; refrigerate covered with the parchment directly on the meat and sauce and the pan lid for up to 2 days. Stew can be frozen in a covered container with parchment over the meat and sauce. Several hours before serving, remove parchment. Most of the fat will have congealed on it. Discard lemongrass and star anise. Using a skimmer, remove meat to a bowl. Bring sauce to a boil, reduce heat to medium and cook until reduced by about one-quarter, about 20 minutes. Remove pan from heat and stir in cornstarch slurry. Return to heat and cook stirring until sauce comes to a boil and thickens. Add carrots and meat with any liquid. Cook uncovered, stirring frequently, until carrots and meat are tender about 45 minutes. Cook noodles according to package directions, if using. To serve: Divide noodles into soup bowls or onto plates, top with stew and sprinkle with basil and shallot slices, if desired. Garnish with basil sprigs. Serve with tasty bread to sop up juices.